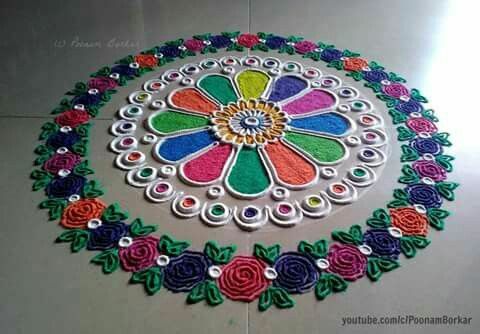 Sanskar Bharti rangoli has its origin in Maharashtra and has got this name due to its round shape. 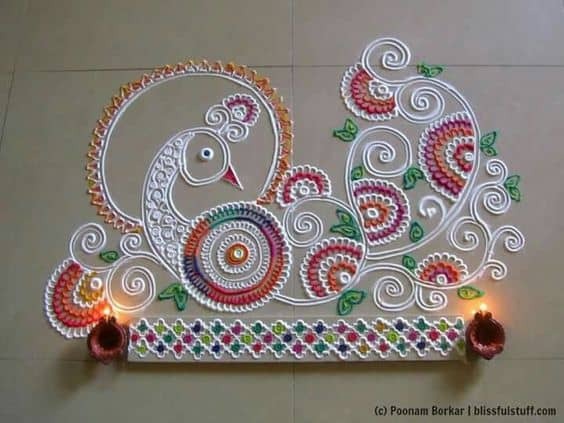 This folk art is drawn to welcome God and guests during festival and celebration time. 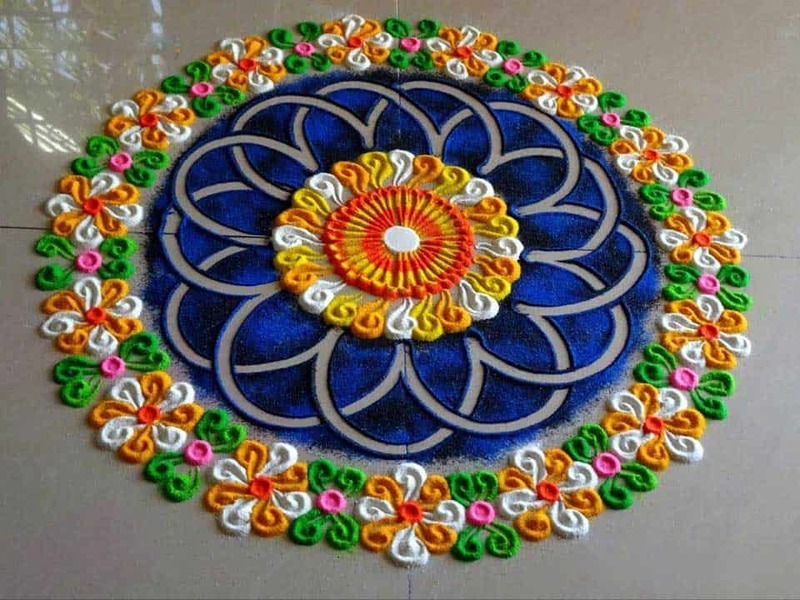 In this post we have listed 22 fresh sanskar bharti rangoli designs for this new year. 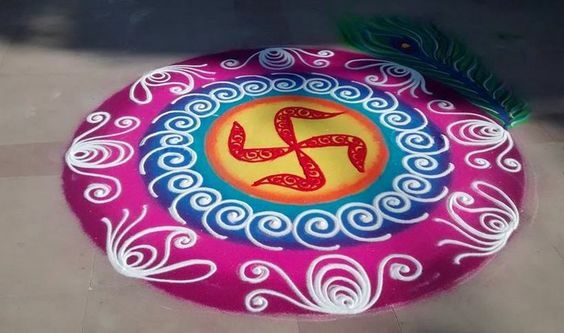 These sanskar bharti rangoli designs are made by using traditional motifs which have their on significance. To understand these designs one needs to identify these holy symbols. Knowing these basic symbols helps in drawing this art more precisely. 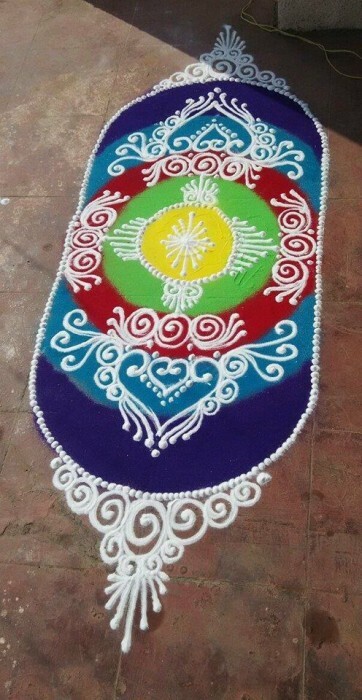 1: This sanskar bharti rangoli is a beautiful combination of small and big colorful circles. 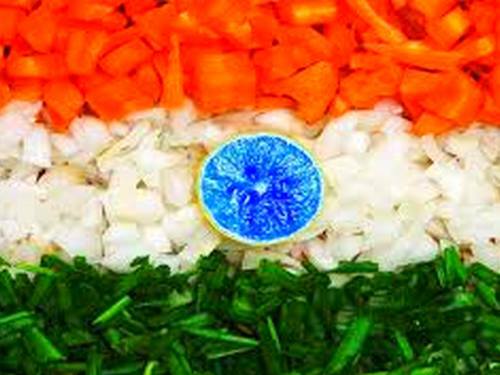 To complete this design white color is used to make the beautiful border of the design. 2. Swastik is the symbol of four cardinal points, or the cycle of the sun, symbol of Brahma, and good luck. This symbol is frequently depicted in floor decorations. 3. 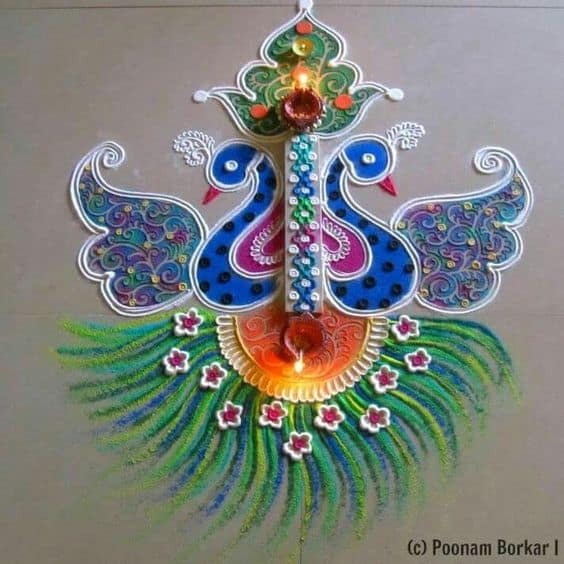 Peacock design is the traditional Indian motif which has its beautiful presence in traditional rangoli design. They are an example of unique traditional art symbolizing royalty, spirituality, awakening, guidance, protection, and watchfulness. 4. 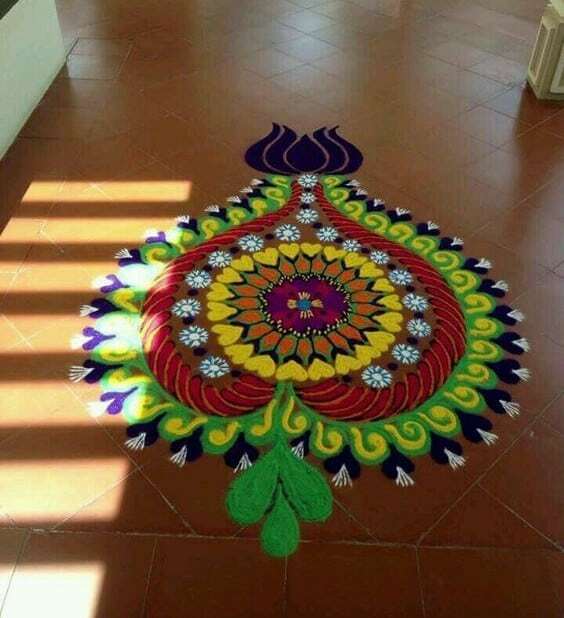 You can also try this double peacock rangoli design. The beauty of this design lies in its symmetry. 5. 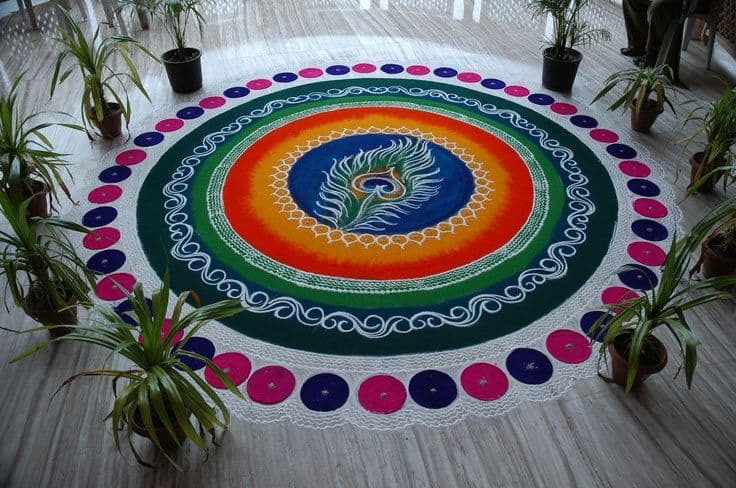 If you are looking for a beautiful rangoli design for the centre of your floor. 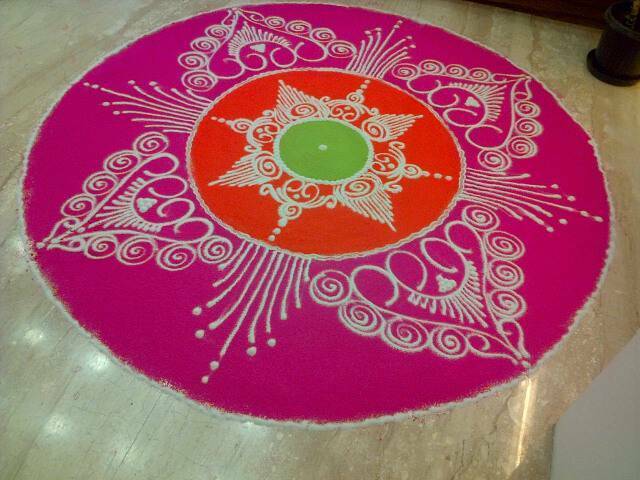 Then you can try an enticing flower rangoli like this. 6. 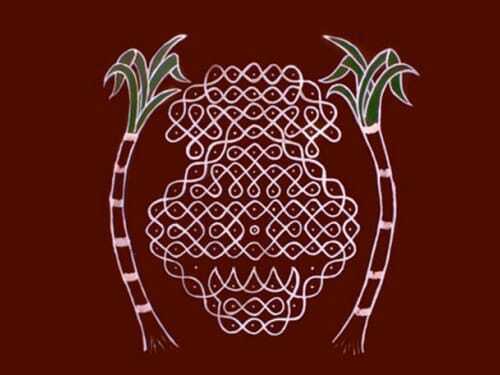 The Kalasha is believed to contain amrita, the elixir of life and thus is a symbol of wisdom, abundance and immortality. 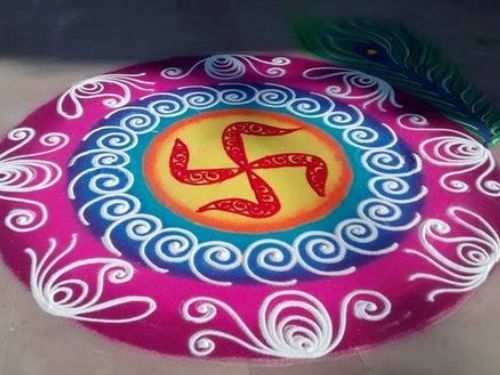 Therefore this symbol is the perfect one to be used in sanskar bharti rangoli. 7. If you are looking for a mix of traditional and modern one. This year you can skip the regular round designs and go for a leafy design with the lotus motif at the top. 8. Om is a sacred symbol which refers to soul and entirety of the universe. 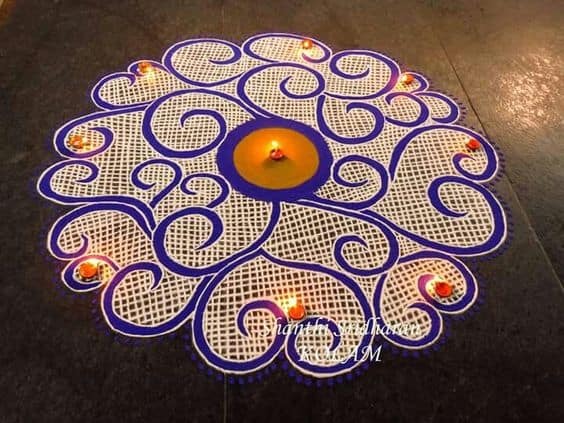 This rangoli is the perfect one for pooja ceremonies. 9. 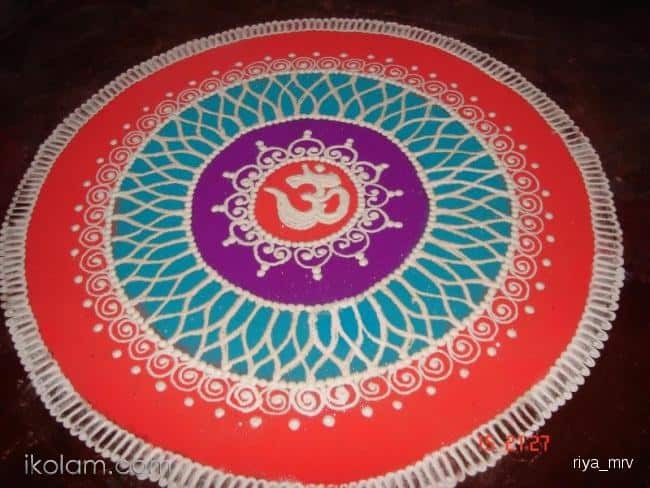 Naga motifs are also predominantly used in sanskar bharti rangoli designs. Naga symbols is associated with cure, life, rebirth and immortality. 10. The lotus flower represents purity and is also associated with symbol of reincarnation. To give it a fuller look try these meshed designs. 11. 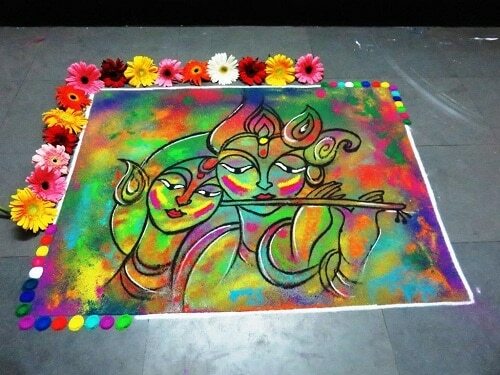 If you are searching for elongated rangoli design with traditional motifs then this can be a perfect pick. You can give it your unique style by experimenting with colors and motifs drawn in it. 12. 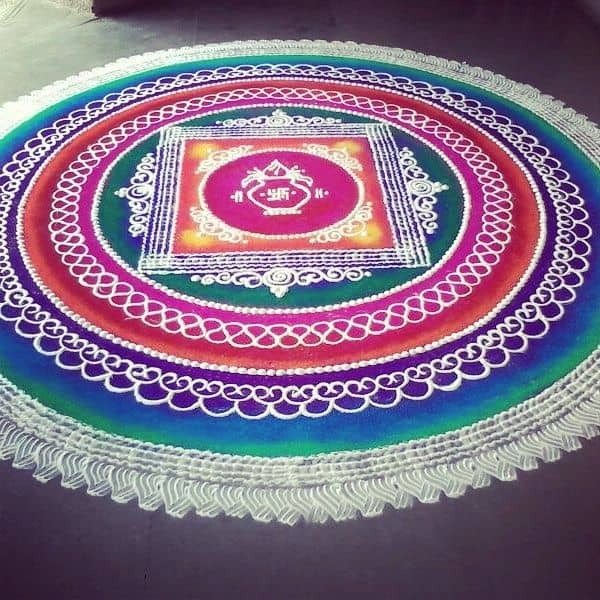 These kind of big rangoli designs look good on the centre of the floor. The spiral motifs used in this design depicts that the life is eternal and revolving. 13. 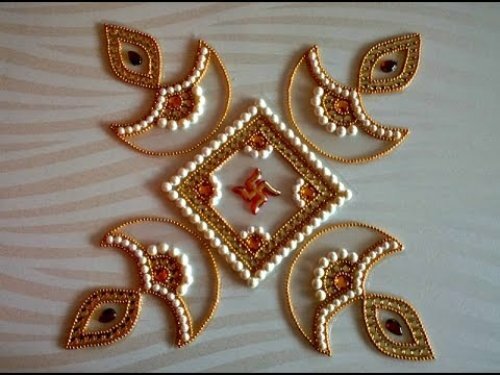 The Shankha symbol which look so divine in rangoli is meant to bestow opulence and grant wishes. 14. 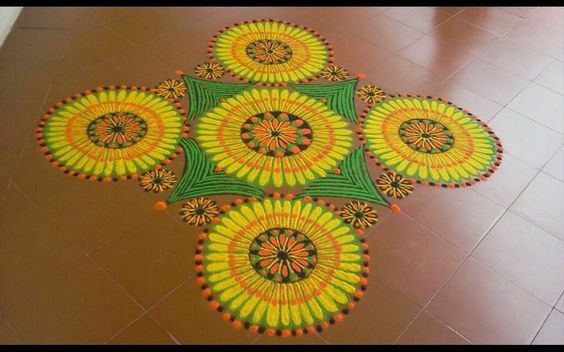 This beautiful rangoli in yellow and green color a good pick to welcome the season of harvest. 15. 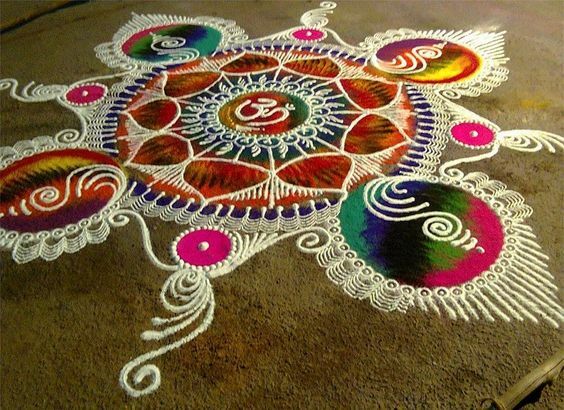 Even with the help of simple decorative motifs one can draw exquisite rangoli design. 16. 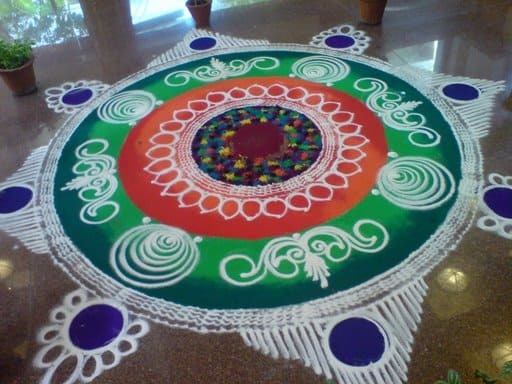 Sanskar bharti rangoli are mostly drawn in free style. 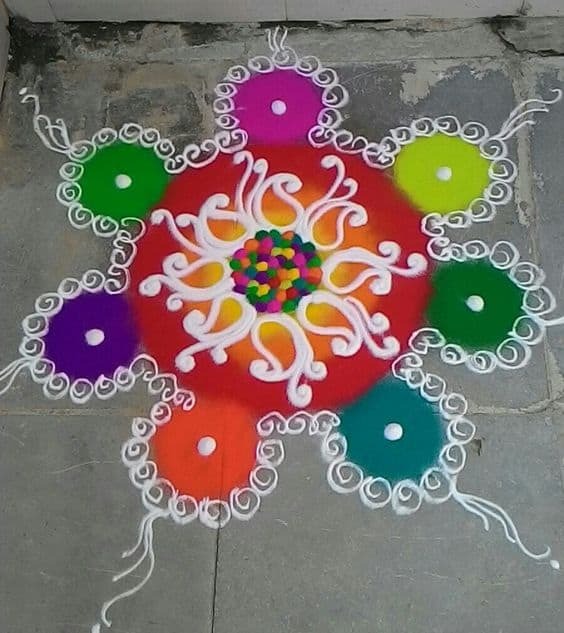 For readers who are looking for a quick rangoli design this one is supereasy. 17. 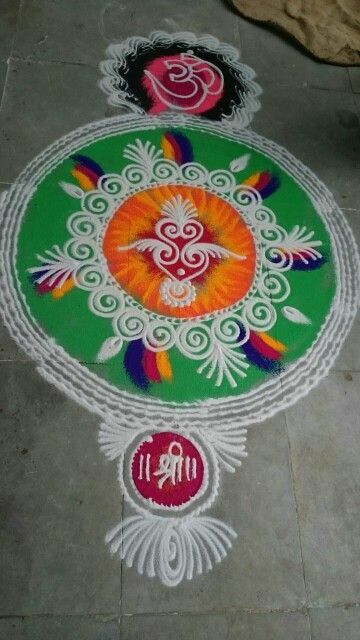 The beautiful peacock feather at the centre gives a whole new look to this traditional rangoli design. 18. 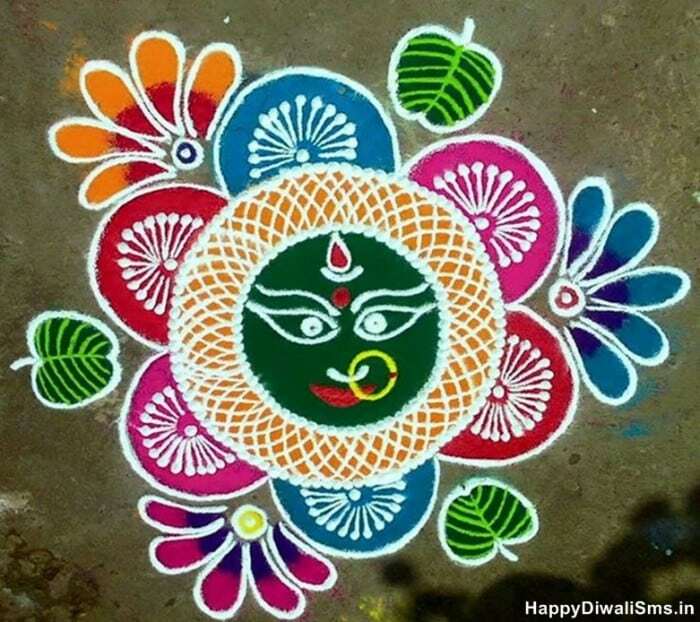 The beautiful symbol at the centre defines the goddess of power. 19. 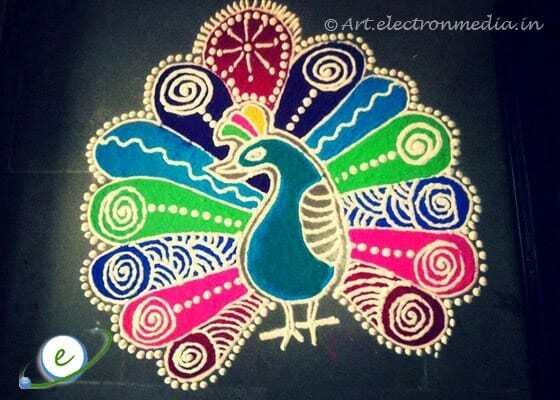 This vibrant peacock design full of colors is the perfect one to be made during celebration. 20. 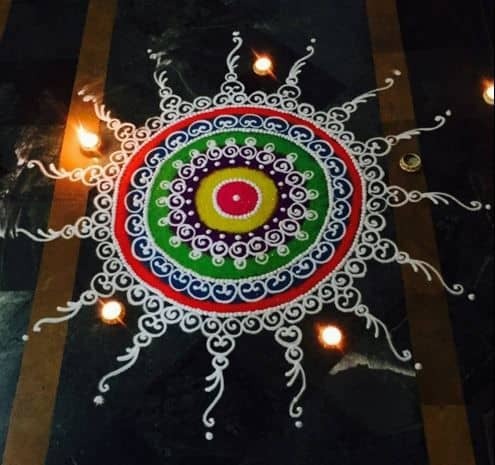 Sanskar bharti rangoli designs are mostly circular and if you want to keep it simple and traditional then you can go for it. 21. 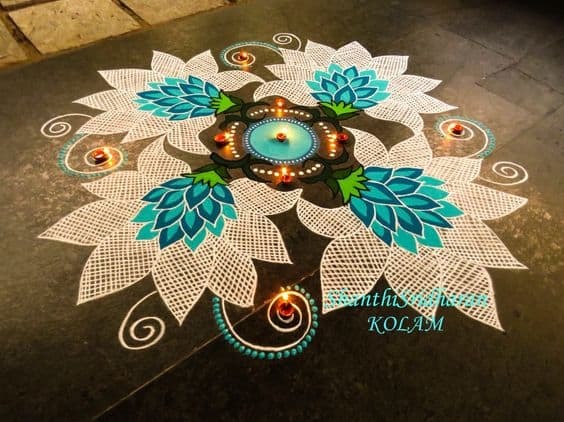 For people who are expert in rangoli making and love doing something innovative and challenging then you can save this design. 22. You can look for some fresh color combination and draw traditional motifs in it. 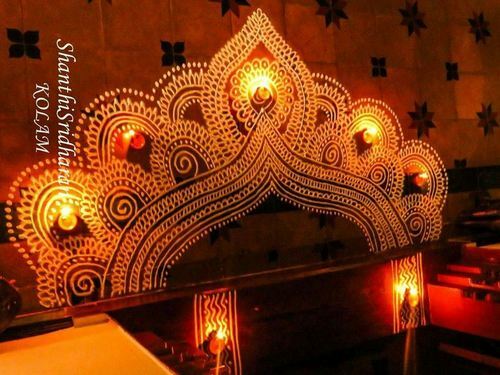 We assure you that the rangoli patterns you will form will be totally enticing. 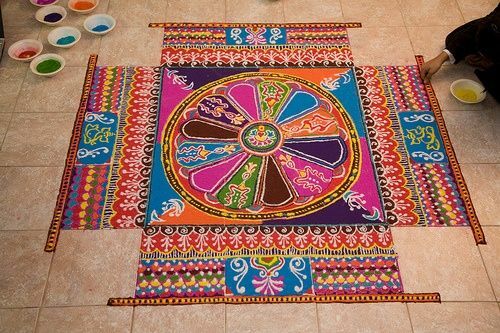 We hope that these sanskar bharti rangoli designs made by using traditional motifs and vibrant colors are going to dazzle in your floor this festive season. 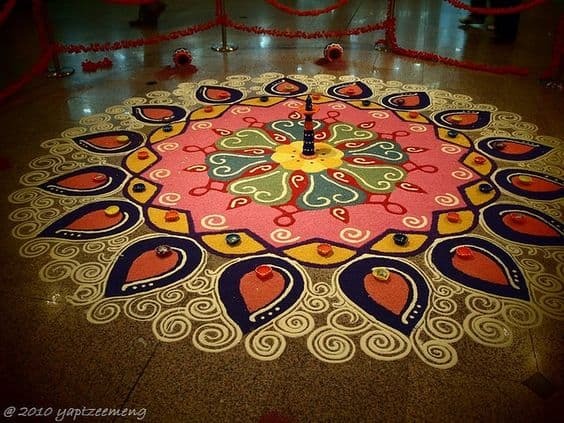 Also see our latest post on 20 Unique water rangoli designs.